"Guess what?" It's got RGB! I want, well guess no rush with the graphics cards so think i will replace my Nocutra with the 360mm version from ROG, IDK why watercooling doesn't have a fan to cool the VRM's with no airflow there they tend to get a little toasty... but with the huge amounts of VRM's/doublers used they tend to not be too bad now. 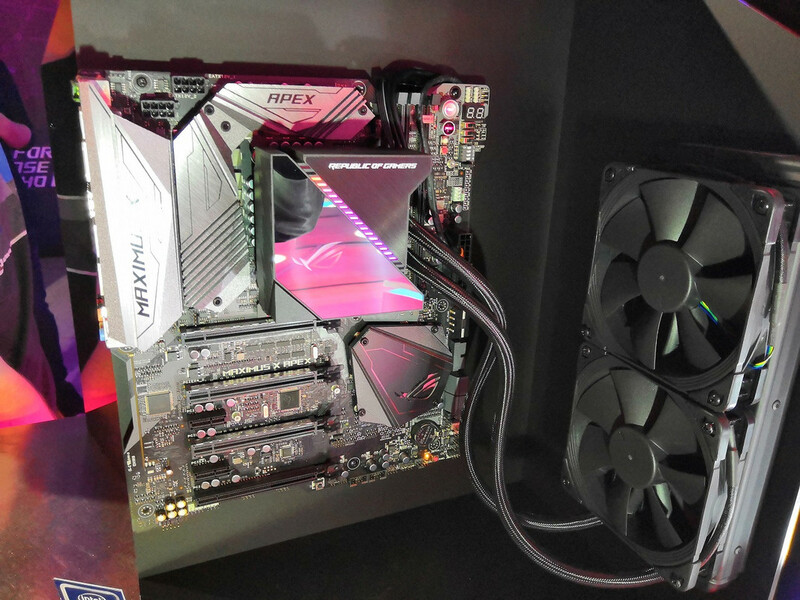 Asus has opted to include a fan built right into the CPU pump to push cool air onto the VRMs and other components around the processor socket. So something like by cryorig A40/A80? Nice. Funny thing is you can buy fittings that have RGB! Let´s face it, releasing a new gaming product without some fancy RGB is almost "criminal" right now... Next idea, adding some neon lights! I just looked it up... first I thought "No, not more of that stuff"... then I thought "woah those glowing tubes look fine!" Help me, I got infected! So is this running Gen 3 Aestek pumps? Still waiting for RGB PCB traces and condoms. I will not be satisfied until everything is RGB. Could I control the lighting (Ryuo) on an MSI B360m gaming plus motherboard ? or does it have to be used on an Asus motherboard in order to function properly. Just checked now and there is something on sale.. The new ROG AIOs use the 6th gen. pump, as stated on Asetek's website. 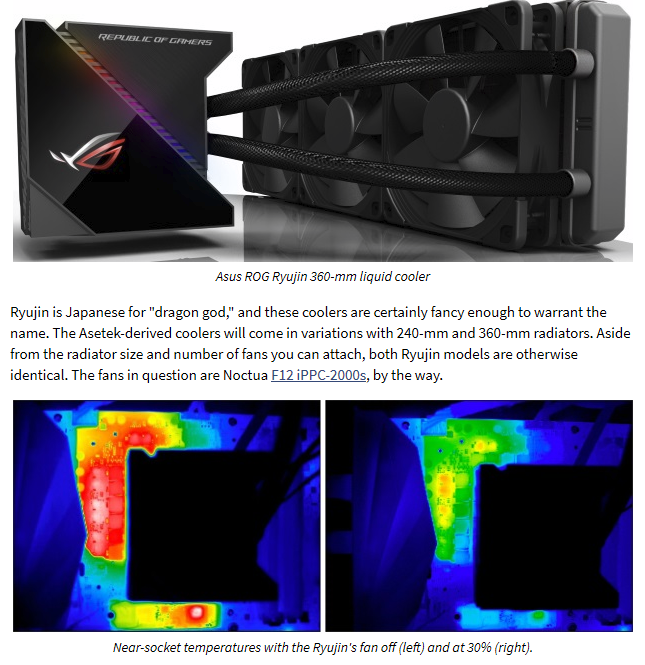 "At the core of the ROG Ryujin and the ROG Ryuo is Asetek’s latest Generation 6 technology, squeezing every clock of performance out by pulling heat away from your CPU." Idk I didnt find it rubbish per say, it is not custom apogee or ekwb but it can do its job. H90/H110 have 5th gen? And it still holds up, now 5yrs old. From what I saw 6th is only better. New h115i pro has it too and it's one of the best aio's. I think this asus ryujin will deliver too. It's like comparing Haswell with Coffee Lake... It's literally 3 generations/iterations apart.